The following article is the first of a three part testimony about my experience with the cult of Freemasonry at my former church, Rowland Spring Baptist Church. Rowland Springs Baptist Church is a Southern Baptist Church in Cartersville, Georgia and is a part of the Georgia Baptist Convention and Bartow Baptist Association. 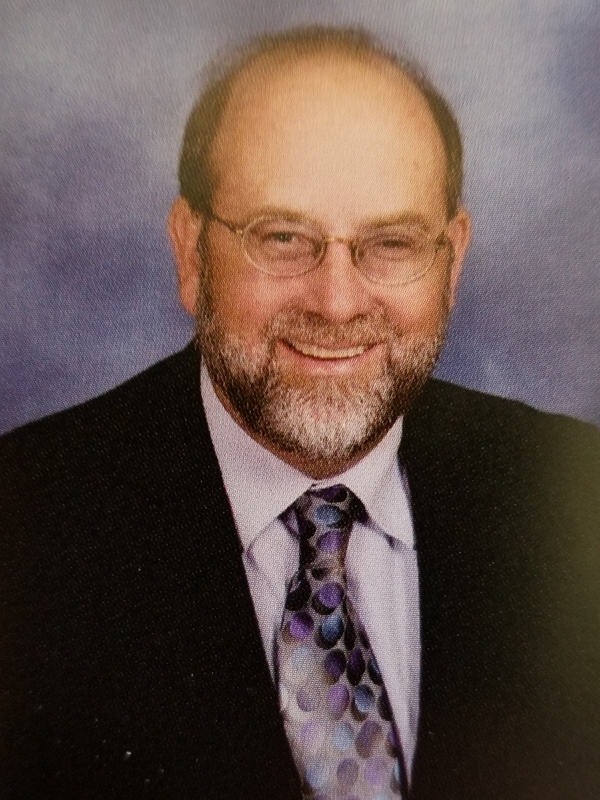 Joe Ringwalt has been pastor of RSBC for over 20 years and is a former Georgia Baptist Convention Committee Member. Pastor Joe Ringwalt stood up before the congregation of Rowland Springs Baptist Church as Sunday morning services came to a close. My wife and I were standing next to him. “It really says something about our church,” he said, “that people of this caliber are joining.” I was a little embarrassed by Joe’s very public compliment of our “caliber” but I was certainly happy, despite my wife’s reservations, to be joining Rowland Springs. I had been kicking the tires of the church for about six months. The preaching was mostly expository, the music was a mix of (mostly) biblical hymns and contemporary songs, the student minister was a Calvinist from the Southern Baptist Theological Seminary, and the Sunday School class we had been attending was edifying and full of lovely Christian people. It felt like a Baptist Church and not a Baptist Church that was trying to be something else. The very week that I joined Rowland Springs I was assigned to be the temporary teacher of the “What Christians Believe” Sunday School Class. At the next Church Conference, I was elected by the congregation to become the official teacher of the class. The Sunday School class I looked forward to attending every week became the class I looked forward to teaching. As someone who had been in seminary for nearly a decade, I was excited to finally begin teaching God’s word to others in the local church. Things seemed to have fallen into place quite nicely. A few months later, however, I was meeting with the pastor, the youth minister, and two deacons in the church basement. I was quietly and involuntarily removed as a Sunday School teacher. My class dissolved. I was encouraged to leave the church altogether. This meeting took place in the wake of my discovery that several members of Rowland Springs Baptist Church were officers of Cartersville Masonic Lodge No. 63. Unbeknownst to me when I joined, Rowland Springs Baptist Church was a stronghold of the demonic cult of Freemasonry. When I stood for the holiness of Christ’s church and against the cult of Freemasonry, Rowland Springs Baptist Church stood for the Freemasons. Joe Ringwalt advertises Rowland Springs as “a warm and loving church” and a “fellowship that wants to love you, provide a place of service for you, and challenge you to allow Christ to live his life through you.” On the surface, it is. However, when I scratched the surface of Rowland Springs Baptist Church, the surface scratched back. I walked into Expedition Church on a Sunday at about 11:45 AM. I was late, again. Getting to church, anywhere really, on-time with three young children was no easy task. The music was already over and the sermon-time had begun began. Star Wars Episode III: Revenge of the Sith was playing on the projector. The congregation watched, during the church service, as Mace Windu and two hapless Jedi Masters fought Darth Sidious to a stalemate. The stalemate was broken when Anakin Skywalker betrayed the Jedi order and attacked Mace Windu. Darth Vader was born. I was aghast, and it was not because Anakin Skywalker had turned to the Dark Side. My wife and I could have watched Star Wars at home. We came to church. After Mace Windu fell to his death, Pastor Tim Samples began a sermon about power. Darth Vader’s traitorous act served as a sermon illustration of seeking power the wrong way. My wife saw Tim’s increasing use of videos and movie clips as an attempt to fill time. I agreed. It was clear to us both that Tim was phoning in his sermons. Some were basically book reports of whatever he happened to have been reading lately. One was nearly a word-for-word plagiarism of a Ravi Zacharias podcast. Another was an 18-minute YouTube video advertisement for the movie Woodlawn. He set aside one Sunday morning to have a Pentecostal named Ray to come up and talk about the importance of tithing; Ray’s talk included the exact amount he gave each month and a testimony of how God miraculously reactivated his broken computer when he began tithing. The Pentecostal presence at the church was growing. Tim also occasionally filled the pulpit with quasi-missionaries who gave live infomercials for their ministries which were thinly disguised as their testimonies. One of the presenters was a lawyer named Joel Thornton who had a side business selling identify theft insurance. Another was Robert Rogers, a practicing Roman Catholic. As Tim’s effort into teaching the congregation at Expedition Church waned, my wife and I grew more and more frustrated. As we left each week, my exasperated wife would ask questions like “What was Tim talking about?” I didn’t have a good answer for her. I recognized that there was a big problem but I wanted to stick with Tim. Tim had for years, as we Christians say, “poured into me”. He gave me the privilege of helping teach the youth group at his church on Wednesday nights. He supervised my seminary work in evangelism, leadership, and preaching. He introduced me around the county Baptist association. He opened his pulpit for me to preach when my preaching practicum class required it. He met with me weekly for lunch. He did his best to mentor and disciple me. He pastored me. At Expedition he sought to equip and encourage the whole body for ministry. He rejected the “invest and invite” model of so many Georgia Baptist churches, where church members are charged with giving money to build facilities and inviting their friends and neighbors to hear a professional preacher evangelize them. Tim understood that the church was a body, not a building, a group of people who were tasked with evangelizing their community themselves, with or without an official church program directing them. Having been stung by the “invest and invite” culture myself, I knew Tim was on the right track with what he was trying to do at Expedition Church. Tim grew up at Roswell Street Baptist Church in Marietta, Georgia under the smooth preaching of Dr. Nelson Price. Price is a venerated man in Southern Baptist culture. In fact, a dormitory at my seminary bears his name. To my knowledge, even in his retirement, Price still bears the title of “Pastor Emeritus” of Roswell Street Baptist Church. Under Price’s preaching, Roswell Street grew and expanded its campus. However, after his retirement, Roswell Street’s properties and attendance levels began to deteriorate. The “invest and invite” model proved not to be a viable long-term solution for Roswell Street. Its large campus became hard to maintain. Tim’s ministry at Expedition is on a much smaller scale. The church property consists of rented office and warehouse space off of Highway 41 in Cartersville. The average attendance is (or, was, at the time I attended) around fifty on a big day. Quite frankly, Tim is no Nelson Price and his preaching wouldn’t fill a big building even if he had one. I used to tell Tim, “You aren’t the best preacher in town, but you’re the best pastor.” Tim was anything but a distant vision caster who didn’t know his flock. He was personally connected to his people. He knew them well. I was once given a personality profile as a part of corporate training. When I told Tim about taking the test he guessed my results almost before I could finish my sentence. I liked having him as a pastor. I liked being a part of the body that was Expedition Church. There were no strangers there and the entire church felt like one, close, multi-generational Sunday School class. Tim planted Expedition Church himself after being released from the staff of Oak Leaf Church in Cartersville (which is now known as CrossPoint City Church). Tim was the self-described “relationship man” at Oak Leaf. The pastor there claimed not to be a people person and was only interested in preaching from the pulpit, not dealing with people. That became Tim’s role. Unfortunately, one of the people the pastor did deal with was his secretary. After admitting to an affair with her, that pastor left the church in a state of disarray. Tim’s job was a casualty of the reshuffling that followed. Oak Leaf was not the first church in Cartersville at which Tim had been on staff. He had come to Oak Leaf after leaving First Baptist Church where he had served as the youth pastor. In his capacity there, starting in the late nineties, Tim was instructed by church leadership to make inroads with the most popular kids. Doing so, he was told, would make other kids want to come to church. This did not sit right with Tim. Sensing God’s leading, Tim eventually left First Baptist, a bigger more established church, for the upstart Oak Leaf. Tim wasn’t the kind of man who would put the popular kids first, even in the face of steady pay check from an established church. Tim was a man of integrity. Unfortunately there is often a cost to having integrity. Expedition Church was a relatively poor church. As its Senior Pastor, Tim’s salary was not any more than that of his Youth Pastor salary at First Baptist. He had effectively worked for years without a raise. To make matters worse, Expedition’s offering revenue consistently fell behind budget. The point came when Tim had to take a second job as a hospice chaplain to support his family. He became a bi-vocational preacher. I am convinced that, with his people skills and compassion, that there is not a finer hospice chaplain in all of Georgia. I am equally convinced that the demands Tim’s new job placed on his time significantly decreased the time he had to prepare sermons and manage Expedition Church. The pulpit suffered. To make matters worse, the office of deacon was unfilled at the church and the other elders did not seem equipped to take turns filling the pulpit. Tim was running himself ragged trying to take care of things with which others in the church should have been helping. When Tim put a Roman Catholic, Robert Rogers, in the pulpit, I could no longer ignore the growing problems at Expedition. Bad sermons were one thing. Handing the pulpit to a member of another religion is another. I approached two elders with my concern that something incredibly inappropriate had taken place in our church. Someone from an apostate church, someone who Galatians 1:8 demands be anathematized, had filled our pulpit. One of the elders was a personal friend of Rogers. He rebuked me for bringing up the matter. The other elder didn’t seem to understand why a Roman Catholic should not fill the pulpit of a Baptist church. The remaining elders were Tim’s father-in-law and a Bapticostal music minister who fed the church a steady diet of Hillsong. Tim could provide me no assurances that a Roman Catholic would never fill the pulpit again. I thought about bringing the matter before the church but quickly realized that it would do no good. There was no official membership roll. A church vote could accomplish nothing and, without a membership roll, was not feasible. Even if a vote had been feasible, I had little confidence in the theological maturity of the congregation. Tim intentionally kept his preaching at a sixth-grade level and Baptist distinctive were not a point of emphasis. Could a congregation who had had no objection to movie clips and infomercials during sermon time really understand what the problem was? Additionally, there was the sensitively of causing controversy in such a small church. I did not think Expedition could financially afford even a small number of families leaving. A couple of families had already left for First Baptist. I loved Tim and I didn’t want him to suffer anymore financial hardship. When I finally saw the church sitting contentedly through a light saber fight during the church service, it became clear to me that bringing the matter of the Roman Catholic preacher up would be fruitless. A dog that can’t smell birds won’t hunt. After the Star Wars sermon I walked out of Expedition Church and never went back. I had come to the sad conclusion that the elders of Expedition Church simply were not qualified for their offices. (I have since learned that a few other families had become disillusioned and left as well; each of them went to CrossPoint City Church.) I haven’t talked to Tim in years. I miss my friend. Having determined to leave Expedition Church, I set out to find my family a new church home. I grew up in Chattanooga attending Woodland Park Baptist Church and listening to Wayne Barber preach. My parents were married there and had been members since before I was born. My family had gone to Woodland Park my whole life until we moved to Cartersville when I was fifteen. I wanted to provide that kind of long-term stability for my family. I could ill afford to make another bad choice. My girls were getting old enough to understand what was going on at church and to make friends in their various circles. Church certainly isn’t a venue intended for small children, most of whom are lost, to make friends. Still, the sermons I heard Wayne Barber preach at age six stick with me until this day and I still listen to them on his podcast archive. I also didn’t want to move my wife again. Family stability, whether in the nuclear family or the church family, is important. She had not been getting fed from the pulpit at Expedition and had patiently endured my faith in Tim for two years. I wanted our family to be in a place where the Bible was proclaimed verse-by-verse on Sunday Morning. So, I made a spreadsheet of every church in the Bartow Baptist Association and began a category by category analysis. The first church I visited was Pine Grove Baptist. It is a small church directly across the street from Dellinger Park and in close proximity to our home. Upon sitting down in the pew, I was hopeful. The congregation and choir was singing from hymnals; there were no 7-11 songs and I could tell Pine Grove wasn’t the kind of place that would sing them. There would be no Hillsong-style rock concert there. When the pastor entered the pulpit, I took hold of one of the large KJV pew Bibles to follow along. He then turned in his own Bible to the story of the prodigal son and informed the congregation that “God had given him” five principles from this story. My countenance fell. He then proceeded to turn the story of the Prodigal Son into a systematic treatise on free will and a Semi-Pelagian rejection of predestination. His thinly veiled polemic against predestination included no less than three invitations, each more elaborate than the last. Recognizing that I must have been the only new person in the small congregation, I was tempted to go forward and “get saved” all over again so that we could all go home. I ultimately decided that it would be bad form and resolved to visit somewhere new on the next Sunday. Somewhere new was Rowland Springs Baptist Church. A church website can be a useful tool for learning about a prospective church. Beyond a simple statement of faith, many church websites include sermon archives, biographical information about the pastoral staff, and a recommended reading list. Knowledgeable Christians can use this data to save themselves from visiting a church they would never want to join in the first place. For example, if a church’s recommended reading list includes books by Andy Stanley or Rick Warren, then there is good reason not to view that church as a viable body. The recommending reading list at Rowland Springs includes books by Voddie Buacham, RC Sproul, John MacArthur, and Charles Spurgeon. To contrast, the recommended reading list at Expedition church included books by Rick Warren, Greg Laurie, Brian McLauren, Jim Cymbala, and Andy Stanley. Sometimes who is not on the list says a lot more than who is. When I perused the Rowland Springs reading list, I did not see any red flag authors. Another indicator of soundness at Rowland Springs was the bio of the Adam Burrell, the Minister of Students and Families. Adam’s website bio indicates that he has an MDiv from the Southern Baptist Theological Seminary and includes a picture of him in a bow-tie that would make Albert Mohler proud. I know a Calvinist when I see one and, sure enough, that’s what Adam is. Even though I am not a five-point Calvinist myself, that Rowland Springs had hired one to teach youth indicated to me that the kind of rank Charles-Finney-style decisionism which was present at Pine Grove and which runs rampant in some Georgia Baptist churches was not present in Rowland Springs. That the church youth minister was seminary-educated family man indicated to me that the church was serious about teaching its youth doctrine and not merely attracting them with fun activities for the sake of winning their parents. In hindsight, I think it may be the case that the church body is so insensitive to matters of doctrine that neither Calvinism nor Finneyism gives them any degree of concern. That the church body has abided extensive Masonic membership indicates that the church’s standards for right belief and living are severely lacking. Unfortunately, the Masonic membership at Rowland Springs was not something of which I was aware at the time. After listening to the Rowland Springs Baptist sermon archives and exchanging emails with Adam, I decided Rowland Springs was worth a visit. I first visited Rowland Springs on my own. My wife stayed behind that Sunday to take care of a sick child. I arrived well before the Sunday School hour started. Kelly Branton, a woman from the praise team, directed me to the Sunday School class for my age group. I wouldn’t have known where to go had I not found her rehearsing in the sanctuary with the rest of the praise team. I took note that Rowland Springs did not have greeters ready to meet visitors and walk them to the proper classroom. Larger churches tend to have an entire team dedicated to doing this. I actually found it favorable that Rowland Springs didn’t. To me, it indicated that the church wasn’t seeker sensitive or McChurch corporate. Not long after Kelly sat me down in the classroom designated for young marrieds, Adam Burrell walked in and directed me upstairs to a Sunday School class that he though was more fitting for me. It was a class entitled What Christians Believe. It was taught by a Deacon named Doug Blankenship and it was based upon the Defenders curriculum that William Lane Craig teaches at Johnson Ferry Baptist Church. I enjoyed the class very much. The next week my family attended with me. My wife insisted that we try out the young married class in order to connect with people our age and in our phase of life. That class was team taught by deacons named Grant McDurmond and Chris McSwain, both of whom are professional school teachers. The man pictured here in the green shirt is Dale Hibbard, Chris McSwain’s Father-In-Law. Dale and many members of his extended family are members of RSBC. 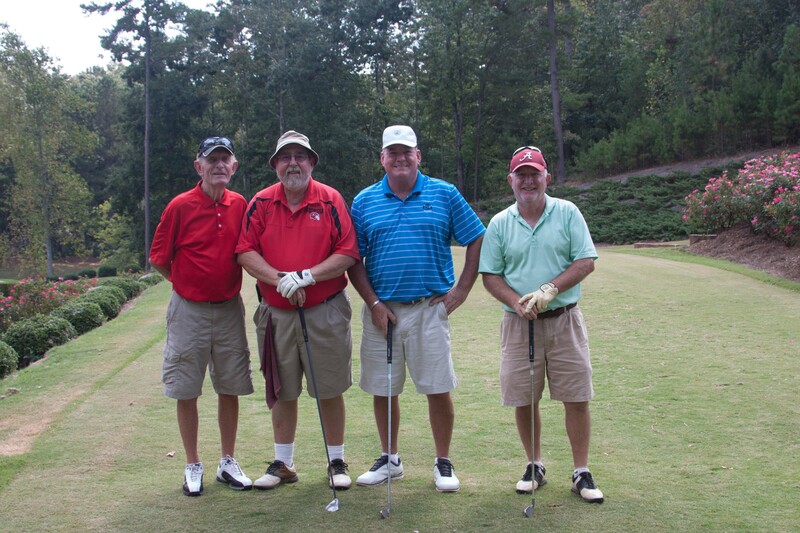 This photo was taken at a Masonic Golf Tournament in 2016 by local Masonic Lodge officer, Tony Ross. Grant and Chris used LifeWay material to teach their class. It took one week for my wife and I decide to move back to the class upstairs. Doug was a good teacher. He was teaching systematic theology and apologetics; class discussion was meaningful. We both enjoyed the class over the next few weeks. It had been over a year since we were a part of a Sunday School class. We became a regular part of the class and met some really nice people. It wasn’t long after we first started visiting Rowland Springs that my wife experienced serious problems with a pregnancy. I sent Doug an email from the hospital asking for prayer. We got much more than that. The entire class descended upon our house with meals and domestic assistance even though we weren’t church members and had only been visiting for a few weeks. I felt like a part of the group. Still, I had trepidation about joining a new church after what we had experienced as members of First Baptist Church of Woodstock and Expedition Church. I really wanted to kick the tires at RSBC. The tires seemed pretty sturdy. We had a great Sunday School class with great people. The music was nearly devoid of Hillsong and featured both hymns and contemporary songs. Joe Ringwalt was no Spurgeon but he preached fairly biblical sermons. I noticed that he was far from a “CEO-Vision Caster” pastor. He made his rounds each Sunday and checked on the various Sunday School rooms. It was his church to pastor and he acted like it. Both he and Adam took an interest in talking to me and learning about my background. Adam even took me to lunch one day. It was a good time. There was an even a friendly old man who always found us in the sanctuary to shake hands and talk before the service began. His name was Jim Moore. As nice as he was, there was something about him that made me uneasy. “I wonder if he is a Mason,” I thought to myself when I first met him. There was just something about him that made me think that. After a couple of months, Joe and Adam began to contact me to ask about coming to my house for a visit. We were “prospects.” They were interested in us joining the church. My wife had reservations about the church in general and Joe specifically and expressed her hesitancy to join the church to me. I considered her reservations but it had been a good few months, especially in Sunday School. One night Joe and Adam finally came over to talk to us about membership. All parties did their due diligence. Adam and Joe asked about our salvation experiences and church backgrounds. I asked, and apologized for having to do so, if Joe would ever let a Roman Catholic fill the pulpit. His answer was a resounding “no.” He was incredulous that Tim Samples had allowed one to preach at Expedition and expressed that Roman Catholics have a “whole different theology”. I also asked about Freemasonry in the church. I was told that none were in leadership. Both Joe and Adam had trouble thinking of any masons outside of a Deacon who was no longer active. Joe expressed his derision for the Masonic craft saying that he didn’t need a “worshipful master.” He was clear that he did not support Freemasonry. I was strongly leaning towards joining Rowland Springs. One thing that held me back was discovering, through perusing the Cartersville Lodge website, that Jim Moore was indeed a Freemason. 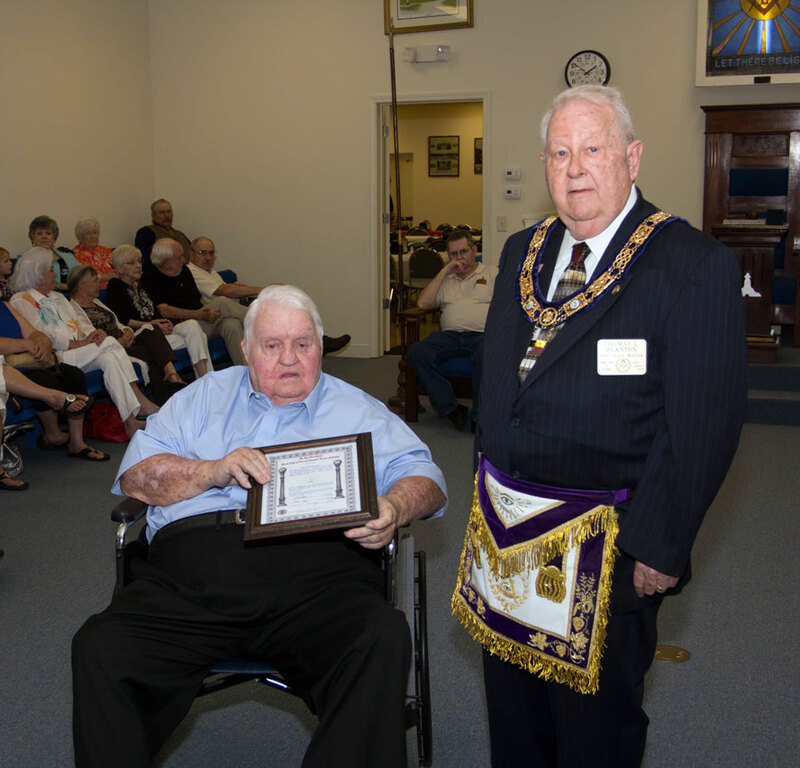 The website displayed a picture of Jim proudly receiving his fifty year Mason award. I showed Adam the picture and asked him if he knew of anymore Masons. He said he did not. Adam had been at the church for years and was the Minister of Families. I figured he was knowledgeable enough. I wasn’t going to let one Mason stop me from joining what seemed like a very good church. Besides, the pastor had strongly communicated to me that he did not support Freemasonry. Unfortunately, as I came to find out later, Jim was not alone. 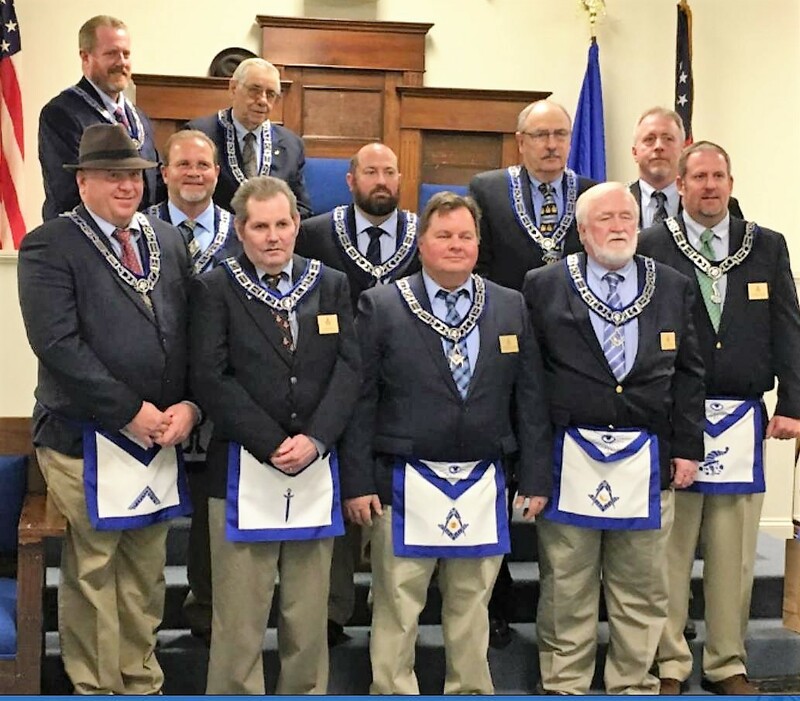 The 2018 Officers of the Cartersville Masonic Lodge include Jim Moore, Freddie Gunn, and Frankie James. All are members of RSBC. Adult Sunday School classes at Southern Baptist Churches almost universally make use of the LifeWay Explore the Bible Sunday School quarterly. Explore the Bible is produced and sold by the Southern Baptist Convention’s publishing arm, LifeWay Christian Resources. One needn’t be particularly conversant in Biblical theology and history to “teach” canned lessons from the LifeWay Sunday School material. Lessons include prefabricated, open-ended questions for the “teacher” to read to his class. In effect many Southern Baptist Sunday School teachers are essentially lesson facilitators who serve in a quasi-pastoral role. Age and marital-status-based Sunday School groups effectively become little churches within a larger church. The Sunday School teacher is expected to lead his “little church” into growing the “big church” through reaching out to his particular demographic. In return for his service, the Sunday School teacher garners influence in the community. Actual learning may or may not occur; some teachers are better than others. A former Sunday School teacher of mine personifies the quintessential Southern Baptist Sunday School “facilitator.” His name is Matthew Gambill. Matthew “taught” the young marrieds class at Tabernacle Baptist Church in Cartersville when my wife and I were members there many years ago. Matthew was a Methodist Republican politician who married a Baptist Republican politician and ended up teaching Sunday School in a Baptist church. Matthew is a well-educated, service-minded, nice person who seems generally devoid of a systematic understanding of the Scriptures. When I was in his class, he basically read LifeWay at us for half an hour each Sunday morning. If he was asked a question about the material, he struggled to find the answer. He was once unable to explain to a class member what a “heavenly host” was. Worse yet, he seemed completely indifferent about the ordinance of baptism. I remember vividly being a part of a conversation about Baptism with Matthew and another class member at a Sunday School party. The class member was from Europe and had a reformed, paedobaptist background. He was lamenting the fact that he had to “re-baptized” by immersion in order to join Tabernacle with his wife. Matthew sympathized and told him that he had to do the same thing. Instead of explaining the importance of believer’s Baptism to the class member, Matthew merely pointed out the pragmatism of not arguing about the requirement. It dawned upon me that the Methodists in our town tend to be Democrats. Matthew is running for the State Congress this year. I suppose I’ll vote for him. It is very unusual to join a new church and be appointed as a Sunday School teacher the very same week. Yet, this unique occurrence is exactly what happened when I joined Rowland Springs Baptist Church. The What Christians Believe Sunday School class was somewhat unique itself. The What Christians Believe Sunday School class at Rowland Springs was not age-stratified or based on Lifeway material. It was a multi-generational class. Ages ranged from middle-school aged to middle-aged. There were teenagers who came with their parents, women with unchurched husbands (a notoriously difficult to place Sunday School demographic), and married couples. The class curriculum was a survey of Systematic Theology. When I first arrived at RSBC, the class was taught by a deacon named Doug Blankenship. Doug, an accountant by trade, had a formal theological education. Doug was not a local politician or small-business owner. In addition to being a well-educated, service-minded, nice person, Doug was a true teacher who understood the class material. When I first came to Rowland Springs, I had been out of Sunday School for two years. I very much enjoyed being a part of Doug’s class. It was worth waking up to get to it on time. Doug took a job in Texas as I was in the process of joining the church. Even though I was a new member of the church, I was a long-time member of the class. Like Doug, I was formally theologically educated. My fellow class members recommended to the pastor that I be given teaching responsibilities. I was more than happy to accept them. My short time teaching the What Christians Believe was a rewarding one. I loved preparing the lesson every week. I was very happy to be serving in Rowland Springs Baptist Church body. There was just one small matter that nagged at me. There was a church member in a cult and no one, including the pastor, seemed to have a problem with it. This was a grave matter indeed. I struggled with how to approach it. Quite frankly I didn’t want to. I was quite content teaching my little class, an oasis of learning and biblical discussion in a LifeWay world. Saying something to Jim Moore about being a Freemason would no doubt be uncomfortable. I continued to research Freemasonry and even published a few blog articles about it. I knew it was a cult and a scourge but I still didn’t say anything to Jim. It was December of 2016. I arrived home from work and there, at the end of my driveway, was a newspaper that I hadn’t ordered. The previous resident of my home was an older gentleman and I was still receiving his newspaper subscription. Being a child of the digital age, I don’t usually peruse printed newspapers. When I receive a newspaper at my house, I walk to the recycling bin, slide the paper out of its plastic sleeve, remove the Arby’s coupons, and trash the rest. On this particular day, I broke with my normal habit and decided to flip through the pages of the paper. Within I found the obituary of Fred Gunn, Jr. He had died at age 85. I had never met him before but I had heard his name at church and knew that he had been sick. 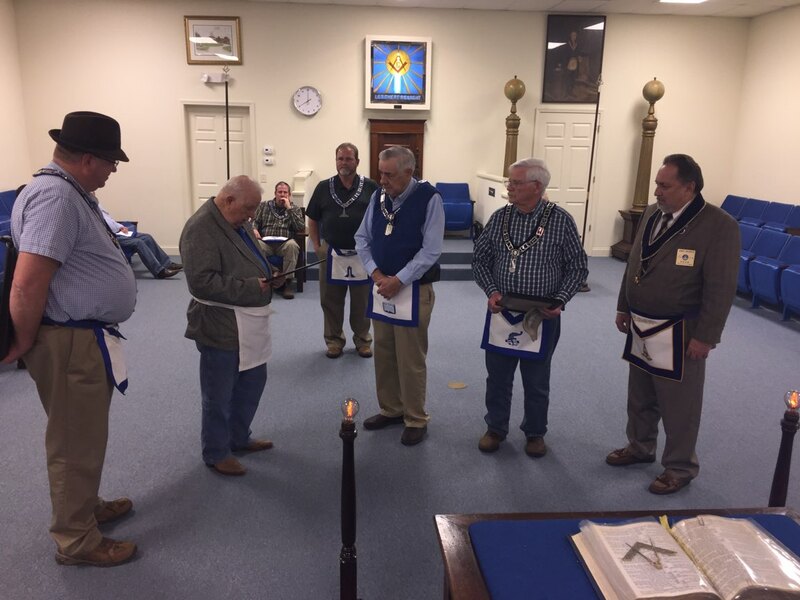 In this photo from the Cartersville Masonic Lodge, RSBC church member (since deceased) Fred Gunn Jr (father of Freddie Gunn) receives a 60 Year Mason Award. “Masonic Rites,” I read the words alongside the name of my own church with embarrassment. My own church was burying a member who chose to go into the ground in front of his friends and family with pagan funeral rites. Jim Moore was an old man and a fifty-year Mason. He could very soon meet his Maker, unrepentant of his paganism. 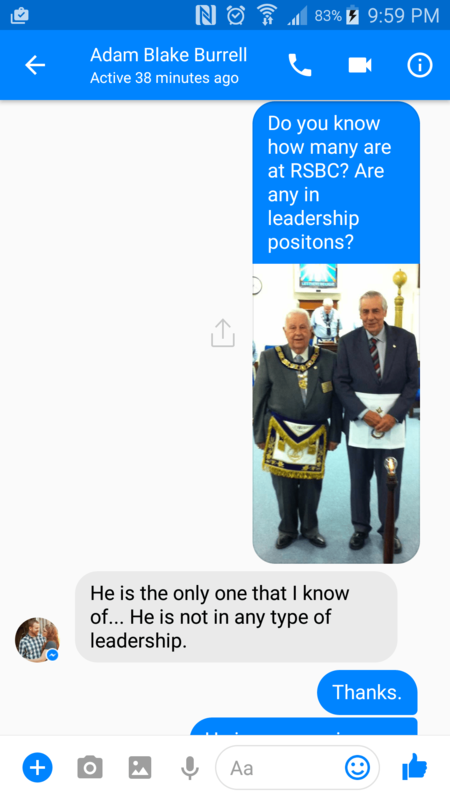 To my shame, I had said nothing to him about Freemasonry. Here I was writing blog articles and making Facebook posts about Freemasonry being a cult while not exhibiting the resolve to speak up in my own church. Fred Gunn’s obituary marked the last day I would ignore Freemasonry at Rowland Springs Baptist Church. I knew that as long as there was one Freemason in my church that it was unholy. I had to take action, scripture demanded as much. I threw away the newspaper as Ephesians 5:11 burned in my mind. The Holy Spirit was convicting me. In this photo, RSBC Church member Jim Moore is named “Honorable Past Master”. With him are RSBC members Frankie James and Alton Kay (now a former member). Kay, an ordained deacon of RSBC was the Worshipful Master of the Lodge in 2017.